The generous way to describe Apple’s AirPods is to call them “hockey sticks.” Less charitable folks say they look like cigarette butts. Regardless of what you call them, they’re hard to miss, dangling from an increasing number of ears as the convenience of fully wireless earbuds catches on. Samsung’s answer to Apple’s oddball design is the new Galaxy Buds, which are cheaper, better looking, and bring some really neat features. Can Galaxy Buds snuff out the AirPods? 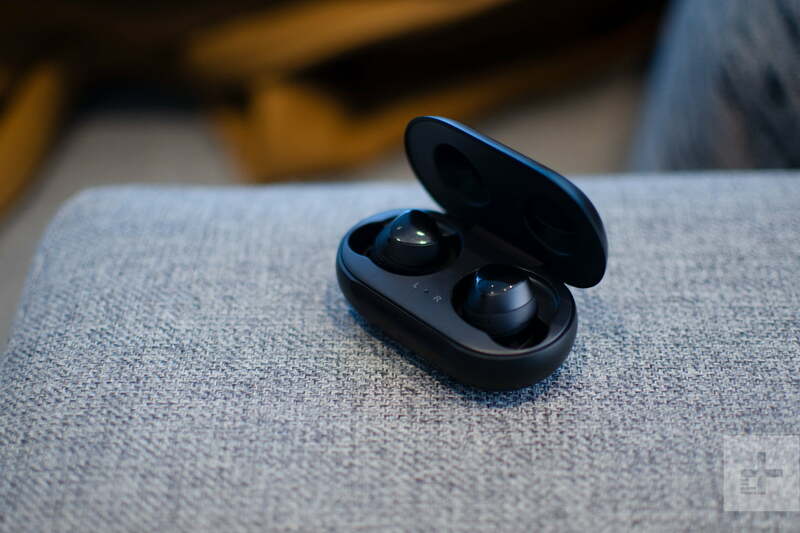 Debuted Wednesday at Samsung’s Galaxy Unpacked event in San Francisco, the Galaxy Buds are very similar to 2018’s Gear IconX, which were packed with features and decent sound, but struggled in a very competitive market. A lot has changed in the year and a half since Samsung unveiled them; the company must clear a very high bar just to compete. For starters, there’s battery life. The IconX was good for 5 hours of playtime, but the case supported just a single charge. In contrast, Apple’s AirPods deliver 5 hours per charge and 25 hours in total thanks to multiple recharges from the carrying case. We also dinged last year’s model for a lack of water-resistance, seen in competitors such as the Bragi Dash Pro, Jabra Elite Active 65t, and … well, pretty much everything competitive but the Apple AirPods. And then there’s their lack of Bluetooth 5.0, and USB-C, and ambient audio – the list goes on and on. In short, Samsung gets a lot of things right with the Galaxy Buds. 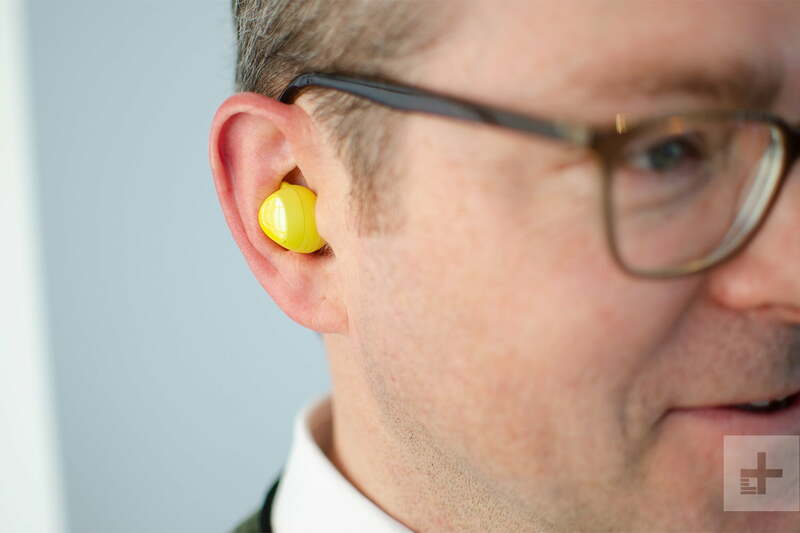 The design remains very similar to earlier models: They’re round, touch-sensitive modules with a fin that locks into the cartilage of your outer ear and soft silicone ear tips that fit into your ear. Put in correctly, they extend just a hair past your ear, a few millimeters less than last year’s model. The buds are comfortable (though we didn’t spend enough time with them to determine whether they lead to ear fatigue), and they stay locked snugly in your ear. As a runner, I’ve lost an AirPod or two over the miles. I ran a few laps during Samsung’s press preview last week, drawing more than a few comments and raised eyebrows. The Galaxy Buds feel much more secure. 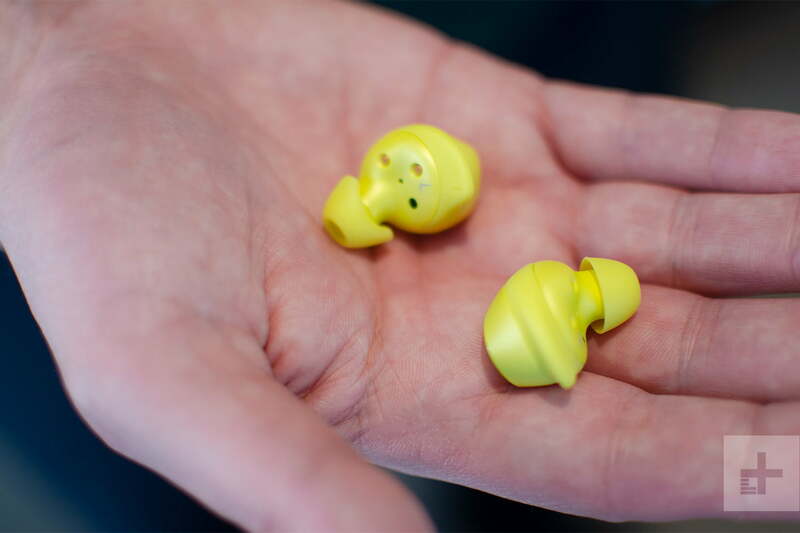 Like all so-called “true wireless” earbuds, the Galaxy Buds come in a charging case in a range of colors, including white, black, and canary yellow. The case supports USB-C at last, and offers an extra 7 hours of charging to go with 6 hours of playtime, for a total of 13 hours on the go. That playback time is an improvement over many current models, but total charge time on the go is still nowhere near Apple. But forget wires or ports: The most intriguing thing about the Galaxy Buds is a new wireless charging feature unmatched by any of the best true wireless earbuds. 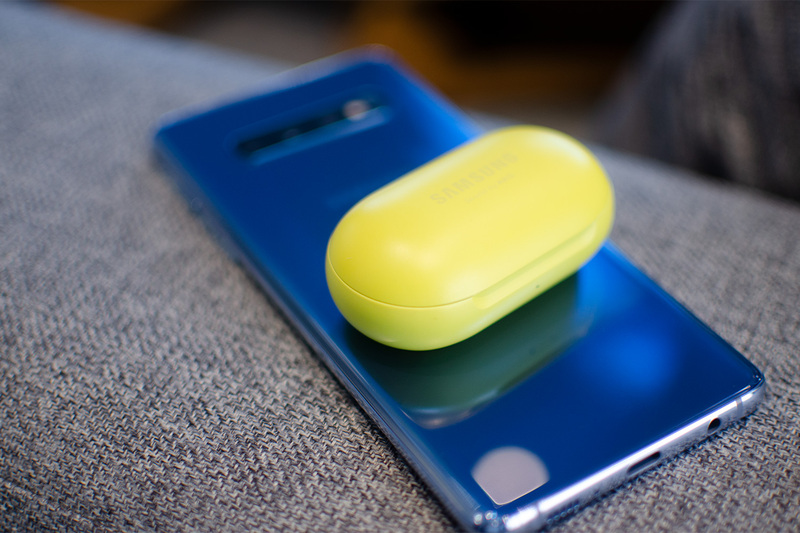 Place a new Galaxy S10 phone face down on your desk (or the bar, kitchen table, or whatever) and drop the Galaxy Buds case onto it to charge them wirelessly. In testing, the feature worked smoothly, with a tiny light on the front of the case that pops on to show the Buds are charging. Sure, this outstanding power-sharing feature works with any phone that supports Qi charging – even an iPhone XS Max — but it makes a very compelling argument for the package. Samsung’s Galaxy Buds lack the noise-canceling features seen in many headphones these days — it’s tough to squeeze into such a tiny package, to be fair. But they come with a number of buzzy features, including an ambient sound mode that allows you to hear your surrounding environment in addition to whatever music or podcast you’re digging on. You can turn the feature on and off through the app, or simply press and hold the earbud to active ambient mode. Unfortunately, we weren’t able to test this out. In our brief time with the Galaxy Buds, we were unable to play any music or take a phone call; the Buds were running early software, Samsung said, and simply couldn’t connect to the test phones the company offered. We will have a full hands-on post coming soon with audio details. The price also feels right: the Galaxy Buds will sell for $129, and will come bundled for free with a few more expensive models of the new Galaxy S10 (more on that below). Free is a great price, but $129 is very competitive as well. Samsung may have hit this price by eliminating the 4GB of storage included with its earlier earbuds, and we applaud this. To be frank, uploading songs to the IconX was really slow. We’re also glad to see the Galaxy Buds added Bluetooth 5.o, and they also pair automatically with Samsung devices. As with a lot of Samsung products, the Buds are also designed to work well with other members of the Galaxy family. In Samsung’s preview at the Unpacked event, the demo crew showed the Galaxy Buds connected to a Samsung tablet allowing the user to answer a phone call from their Galaxy phone directly on the tablet. The Buds also offer quick access to Bixby when paired with Samsung mobile devices, and we expect there may be other intuitive features for those deeply invested in the Samsung ecosystem. That said, Samsung misses with a few key specs we were certainly hoping for. Battery life of 6 hours per charge for Bluetooth streaming exceeds what the Gear Icon X offered, but the 7 hours of additional play time in the case feels insufficient, especially relative to the AirPods and many others. We hoped for IPX4 water resistance or better. It ain’t here, so you’ll need to treat them with care in wet environments, although they are sweatproof. Gym, good. Pool, bad. Samsung offers a compelling package by bundling the Galaxy Buds for free with the all-new Fold, S10, and S10 Plus phones during the preorder period; your friends will certainly be jealous of the charging feature, and you can’t beat the price. But are they worth the money as a standalone? Anyone who finds Apple’s AirPods silly looking will appreciate the design, and rumors of dramatic change coming to the AirPods 2 (including noise-cancellation and water resistance) won’t sway them. For everyone else … the fit and finish feel fine – let’s see if the song remains the same. The Galaxy Buds will be available on March 8. Updated with more information discovered during the Samsung Galaxy Unpacked event.